Over 3,000 incidents recorded across 12 months with a domestic abuse motivation. In the tweleve months to September 30 there were 3,145 incidents recorded in the Armagh, Banbridge, Craigavon Council area were there was a domestic abuse motivation. The Police Service of Northern Ireland this week launched the Domestic Abuse Christmas Campaign to encourage anyone who is a victim of abuse to report it. The campaign, entitled ‘Domestic abuse is wrong, pick up the phone and make it stop’ is designed to encourage the reporting of incidents and make domestic abuse victims aware that they can take steps to stop it. It will run throughout December online and officers will also be distributing posters across Northern Ireland. Speaking at the launch, Detective Chief Superintendent George Clarke, Head of the PSNI’s Public Protection Branch, said: “The sad reality is that at this time of year, the number of domestic incidents increase. “On Christmas Day alone last year, there were 79 recorded incidents and on Boxing Day, there were 111. That is a total of 190 incidents over that two day period. In the period from 24 December to 28 December last year, there were a total of 515 recorded domestic incidents. “These statistics are shocking, especially when you consider the fact that behind every statistic is a victim who has had to endure abuse and that those victims, both male and female, may have suffered abuse many times before calling the police or contacting other agencies for assistance. year, there were 13,313 domestic abuse crimes reported to police. “Between October 2014 and September 2015, there was 28, 189 incidents of domestic abuse reported. Over the same period, last year, there were 27, 974 incidents of domestic abuse reported. We also know that a large number of incidents aren’t reported to police at all. 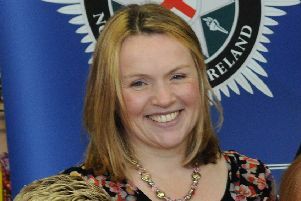 “As the Police Service of Northern Ireland, it is our job to keep people safe. We know that domestic abuse is a frightening crime which can affect anyone often leaving them feeling isolated and alone. “We are launching this campaign to remind everyone that no one should have to endure abuse. If you are a victim of abuse, please remember you are not alone and that there are people who can help you. Please come forward and report the matter to police. We work closely with our partner agencies to ensure the victims get the help they deserve, to highlight the issue of Domestic Abuse and to explore ways in which we can keep communities safer.